In early September, the fifth most populous city in Russia will host the Third Annual International Business Summit, where the focus will be on infrastructure development. The Nizhny Novgorod region, where the volume of foreign investments has already reached $ 1 billion, is seeking further investment in infrastructure projects. In early September, Nizhny Novgorod, the fifth most populous city in Russia, will host the Third Annual International Business Summit. The event will take place against the background of a complex geopolitical situation and international sanctions. Among the main themes at the forum will be import substitution and attraction of investment. Investors from The Arab League, Belgium, Germany, Italy will take part. The Nizhny Novgorod region is 400 km from Moscow, and is an important transport and economic centre. Since 2005, the region has been developing rapidly and many of the economic indicators are already above the national average. By the end of 2013, the industrial production index in the region turned out to be 17 times higher than the average figure for Russia. Gross regional product grew by 4.2 percent, while Russia's GDP grew by 1.4 percent. A number of major projects are already being implemented. Valeriy Shantsev, the acting governor of the Nizhny Novgorod Region, says, a bypass highway exclusively for fright traffic is already being built. In addition, a substitute for the only bridge across the Volga is being built, and will double the highway traffic capacity from Nizhny Novgorod to the north and vice versa. The construction of this infrastructure project worth $360 million and should be completed in 2016. A modernization of the airport, the first part of which is scheduled for completion by January 2016 has begun. The reconstruction project of the main railway station has also been approved. The main task in this project is to make maximum use of the underground space, as is customary abroad. “If we talk about the Nizhny Novgorod industry, we need to build a few important installations: a catalytic oil cracking complex on our Kstovsky refinery and a large machine-building plant in Nizhny Novgorod – both projects costing about $ 1.2bn,” the regional administration said in a press note. Russian regions are seriously competing with each other for investment. 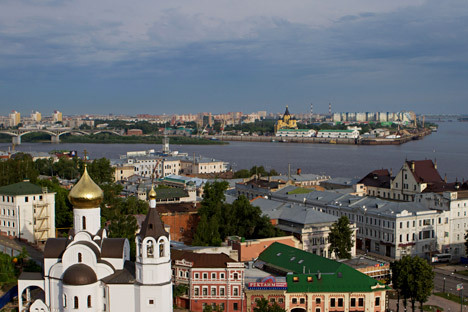 The Nizhny Novgorod region was one of the first in the country to have enacted laws supporting investment, innovation, technology parks, and state and private partnership. At the moment, the region is offering investors two types of sites for the implementation of investment projects: on vacant land with all the supplied utility lines, and the unused areas of industrial enterprises within the existing industrial parks. The region provides financial support to large-scale, long-term and capital-intensive projects, giving them a priority status and providing substantial tax benefits on income and property. Currently, priority is given to 82 investment projects. The most promising areas for development are considered to be the automobile, chemical and petrochemical industries and metallurgy. According to the statistics, since 2006, the volume of annual investment in the region increased four times, the volume of foreign investment increased tenfold – today it is more than $ 1 billion. Global giants such as Liebherr, Onduline, Uniline, Skoda, Volkswagen, and Mercedes are working in the region. In recent years, China has become one of the main trade partners in the region. According to the Department of Foreign Relations of the Nizhny Novgorod region, at the end of 2013, China ranked 4th in volume of trade with the region. According to the Volga customs department, the foreign trade turnover with China in 2013 amounted to $467.8 million. Information from ‘Annual International Business Summit in Nizhny Novgorod,’ the summit’s official publication, was used in this report. More information about the International Business Summit can be found in the official website.